It was a piece of glass, but calling it a piece of broken glass wasn’t right. Once, it must have been broken. It must have had jagged edges like knife blades and been treacherous to pick up with bare hands. But now, it was something else. It had become something else. More like a pebble. It no longer seemed broken. You could still tell it was glass. But it’s outside was now frosted, its jagged edges dulled. The waves and the sand had done that, over time. But over how much time? Just how long would it take for gleaming, hard glass to change to the texture of a Rowntrees fruit pastille? Not as green as the lime ones, not as yellow as the lemons. She looked round furtively, then quickly licked the sea-glass. It tasted of salty grit. Not unpleasant, but definitely not a fruit pastille. And the lick caused magic. Where the glass was wet, you could see deep down into it, the sea-sugar-coating melting for a few moments, then drying in the hot sunshine and closing up the secret, ancient world inside. Dad, tell her! She’s licking pebbles! She quickly shoved it deep into her pocket and in the same movement turned an innocent face round to the watching world, open empty hands displayed wide. The best bit of the beach was when the tide was going out, leaving a band of smooth wet sand. The grown-ups like the dry beach for sitting on. She couldn’t imaging why you would come to the beach and just sit on a towel, when the sea was just there. Just over there. As the waves drew back, they left stories behind. You could read them if you looked. Once, the shells had all been living animals. Stubby conical ones, or snail spirals, or almond-shaped like ladies’ fingernails, or long and thin and fragile. Snow white, glossy dark grey, brown-green or mottled, they all shared the same secret - the inside where the creature once lived had a delicate pearl lining. She knew about pearl, and she knew her name meant pearl, in a language spoken long ago. A tin bucket made for building sandcastles, ideal for shell-collecting. A little seawater in the bucket made the beauty of the gathered shells show up better. If you watched the slowest and smallest of the waves closely, you could see tiny crabs being washed ashore. These were animals that lived both in the sea and on the sand. She never saw big crabs on the beach but these tiny ones could be scooped up in the bucket and inspected at leisure. Some scuttled under the shells, others floated belly-up on the surface of the water. It seemed kind to give the rescued baby crabs a bit of seaweed to hide under. Maybe they could eat it. The bucket became a sea-garden. It would be her own sea-garden, to take home and look after. Right then, come on! Time to go, it’s gone six…Bring your bucket and spade! Trail and trudge up the ridged concrete ramp to the promenade. A chaos around them of kids, bags, cardigans, towels, shoes, and there’s a bus to catch. The paving stones feel hot under bare feet. Dry your feet on the big towel, haven’t got all day. Mum briskly tipped the sea-garden, with its population of dead crustaceans, slimy seaweed and icy seawater, over the railings of the promenade. Straight onto a very surprised sunbather. As the lady picked little crabs and seaweed out of her stylish bouffant hair-do, she said some bad things to Mum in a loud voice. Then the bus came. It just wasn’t fair. They were hers. She had found them. Nobody else wanted them. And now they said she couldn’t take them home. The pebbles represented every time they’d been to the beach. Some were small and some were large. She found a cardboard box to keep her collection in, and stored it under her holiday-house bed. Each pebble had its own special merits - shape, texture, colour. Grey, white, pale pink, green. Looking close, you could see they were not just a solid lump of rock. There were twinkling crystal pieces, darker specks, strange blob shapes, and when you moved further back these all merged into one ‘rock’. Several had veins of a different coloured rock tracking through them. One or two had faint impressions of shells from sea animals that had been alive a long time ago, but had died and turned into stone. We are NOT lugging a sack of stones all the way back. They are NOT going in the suitcase AND THAT’S FINAL! Trotting along beside them the way to the bus, she shoved her angry hands deep into the pockets of her holiday shorts. And there it was. 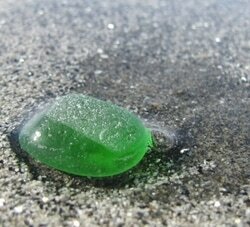 A pebble of smooth, sugared sea-glass snuggled into her grip, and she forgot to be angry.